New Metzeler Sportec M5 Interact Tire - Let's you measure up! Mines bigger! Oh yeah, prove it! 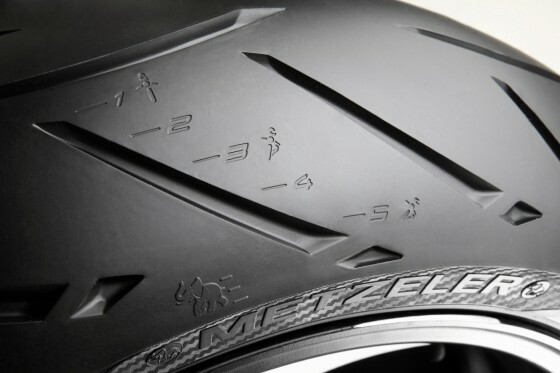 All new for 2010, the Metzeler Sportec M5 Interact tire is set to redefine the motorcycle industry with its proprietary Chicken Strip Assessment Technology. Do your buddies brag about how far over they can lean their bike? How they’re the next Golden God of Canyon Carving? With Metzler’s Chicken Strip Assessment Technology system, there’s little doubt about how much you’re compensating for something else; and now you can rate your manhood on a scale from 1 to 5. Now go chase that crazy elephant! Chase him! Should be available this spring at RevZilla.com and should begin to ship mid Feb 2010.